We had an early burst of summer sunshine. I was ready with the accessory of the season - a short white jumpsuit complete with brass buttons acquired brand new on eBay. All blingtastic, I was going to attend the lunchtime launch of Spooning with Rosie, my friend Rosie Lovell's book. The lovely Rosie runs a deli cafe in trendy Brixton. Vintage dresses and unshaven faces were going to rub shoulders amidst mounds of quality cheese, loafs of bread and stacks of her cupcakes. The anticipation was immense as I dressed mini Basu in a co-ordinated romper. 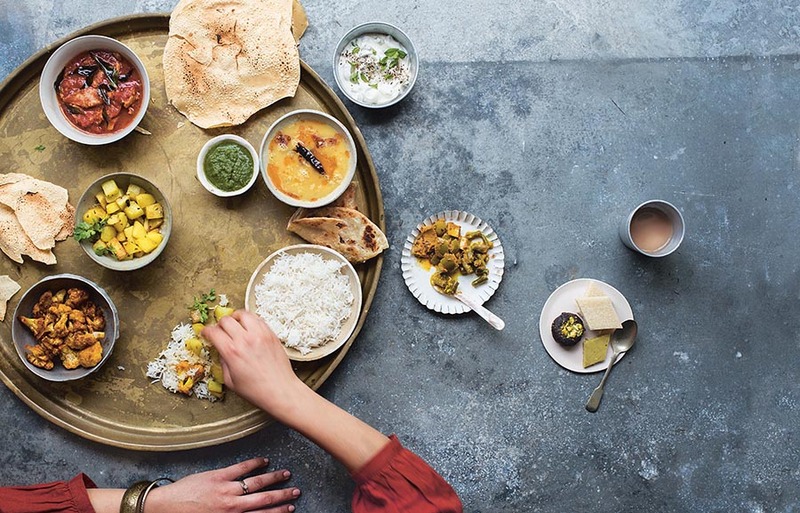 Rosie's cookbook is a sensational tome brimming with eclectic recipes that nod to London's vibrant cafe culture. That aside it featured my Bhapa Doi Bengali cheesecake recipe with a mention of yours truly. Several glasses of wine and hours of mingling later, I couldn't wait to get stuck into a semi-complicated recipe that matched the dizzying heights I had reached. It was going to be an easy Kofta Curry, soft spicy meatballs in a tomato curry using a tin of tomatoes. I mixed the Kofta or meatballs before going to bed. Cooked the dish the following day. Scooped the finished lot into a bowl. Just in time for my hungry dad's arrival. This experienced cook was not going to be easy to please. "So how is it", I asked, waiting for the lavish praise. "Delicious", he replied. And just as I was about to mutter a thanks, he added: "You could have cooked the masala a bit more." Nothing like family to keep you grounded. Here's the perfected recipe for when you want to show off. Best served with a pinch of humility. PS = I made this with beef mince but you could just as easily substitute it with lamb. Mix all the kofta ingredients together and stick in the fridge. It needs a good hour, but I did this before going to bed and left it in the fridge until I was ready to cook. When you’re ready to make the curry, halve the mince mixture and fashion it into two large sausages. Then break off equal pieces and roll them into largish balls on a chopping board and leave to sit. Chop the onion, ginger and garlic finely. Bring the oil to heat on high in a large non-stick pan. When it’s hot, chuck in the bay leaf and cinnamon. As they start sizzling, mix in the onion, ginger and garlic and fry until golden brown. This will take a good 10-15 minutes on a high heat. If the mixture starts getting stuck to the bottom of the pan, add a little hot water and scrape off. Next, add the paprika and chilli powders and fry for another two minutes. Then mix in the tin of tomatoes. You could use three large ripe and red chopped tomatoes if you prefer going fresh. Now let this masala mixture start bubbling, then lower the heat to a simmer and cook for 10 minutes. At this stage, oil will start oozing through little pores in the mixture. When it does, gently lower the koftas into the curry. Cook for 10 minutes and then flip them over to the other side for another 10 minutes. Alternatively you could grill them for the same amount of time under a medium heat and mix them into the curry. Leave the curry bubbling, just add a bit of water if it dries up. Finally, add the garam masala, salt to taste and sprinkle chopped coriander. This was lovely with a hot roti that I bought in a store earlier. First time here :)u have a pleasant blog with some lovely recipes. 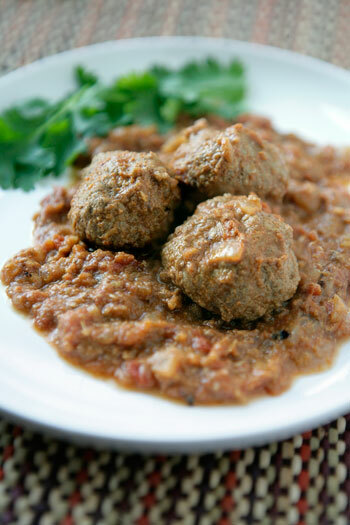 These look great – second recipe I have seen for koftas, and now I am really craving them!!! Awesome.. i always shied away from cooking these lovelies, thinking it was so complicated. but then that was before i chanced upon one mallika. u rock. i will try it, and yeah will remember being humble. Haha! Yeah, they always know how to put you in place gently! Looks great though. Bappa Doi! Yum! Looks like you had a fun party, will check it out. Have a great Summer, busy for me and full of excitement. Vacationing in Hawaii for the first time, looking forward to it. Mmmmm… this looks so delicious. Can’t wait to try it. Hope you didn’t attempt cooking with turmeric in your flashy white romper! PS So glad you are posting again. Missed you! wow mallika there is nothing humble abt a kofta I tell you..:)..hope the lil one is doing good..and congrats on the recipe being featured..am sure many would be benefited..thats a lovely one you know! Mini Basu sounds divine! Precious little poppet she must be Mallika, picture please! She must be an absolute sweetheart! These koftas do sound good & just what I love about them, most of the work can be done before. And yes, nothing like the family to keep you grounded LOL!! Congrats on your recipe inclusion…YAY!! Man, my grandmother was Italian and she made the most incredible meatballs I ever tasted, like you had died and gone to meatball heaven. Sadly, she didnt leave a single recipe for us so I’ve been trying to work it out on my own… slowly working my through the meatball recipes here, I still cant figure out what her secret ingredient was though!!! Made this tonight, hubby said wow! Better than Khyber Pass Restaurant takeout in St. Paul, MN!! Will definitely be making this over and over. Miss, I have to say: you made my Sunday. Just finished stewing this dish, and it came out wonderful. This was the first time, and it certainly won’t be the last…..